​​ ​TEXAS – Texas is named the No. 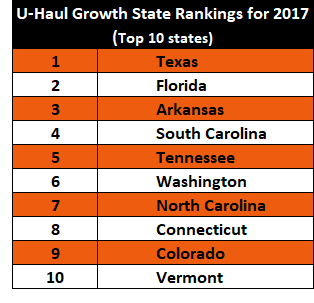 1 growth state in 2017, according to U-Haul data analyzing the past year's U.S. migration trends. Year-over-year arrivals of one-way U-Haul truck rentals rose 1 percent while departures climbed 3 percent from Texas's 2016 numbers. McKinney, Prosper, College Station, Temple and Kaufman paced Texas's net gain of one-way U-Haul trucks. Austin, Midland, Pflugerville, New Braunfels and Irving were among other notable cities to post strong net gains. Texas secured the No. 1 growth ranking for 2016 after settling for the No. 39 spot for 2015.